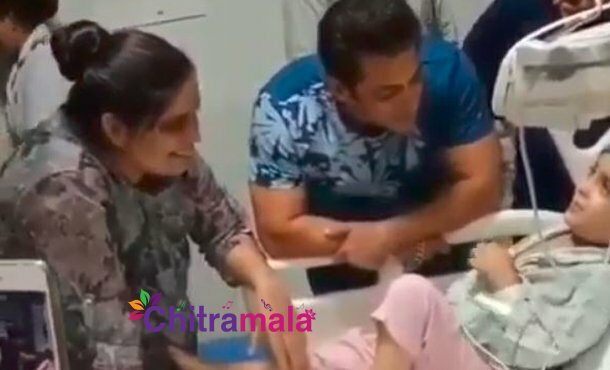 Salman Khan Goes Emotional After Meeting His Special Fan In A Hospital! Bollywood Superstar Salman Khan is also well known for his humanitarian side. The actor has already done so many charitable works. He even started his own charitable trust with the name of ‘Being Human Foundation’ in 2007 which provides education and health care services for the underprivileged in the country. Now, a video of Sallu Bhai is going viral on social media. The video is shared by one of his fan clubs where he is seen meeting a cancer-stricken child who is a die-hard fan of Salman. The kid who has been undertaking cancer treatment expressed his wish to meet Salman. His mother called Salman’s manager and conveyed the same. Salman immediately visited the little boy and spent quality time with him. He also met other kids in the hospital and made them all happy. The video is just like a sample showing why people love him so much. On the professional front, Salman Khan is hosting the 12th season of Bigg Boss in Hindi and is also starring in the upcoming movie ‘Bharat’ being directed by Ali Abbas Zafar. Disha Patani and Katrina Kaif are the female leads.